BlackBerry's latest Android offering - the KEYone - is now available to purchase in the Netherlands. 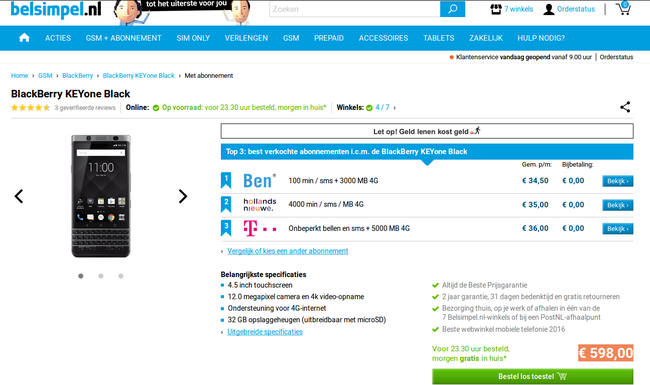 Multiple third-party retailers like belsimpel and mobiel.nl have the phone listed on their website for around €600. Of course, the handset is also available on contract, with pricing starting as low as €0. The KEYone is already available in a handful of key markets, including the US, UK, and Canada. Recently, Canadian carrier Telus starting selling the phone to its consumer customers as well. Over in the UK, Carphone Warehouse has also started offering the handset. They certainly made the keyone more drop proof than anything else on the market. With your attitude every all touch isn't fit for sale.